Firstly - a Blessed & Peaceful 2011 to you & family. Not only is 2011 a prime number year but we're also going to see four planets in conjunction with one another during May. Astrologically, this signifies many dark strangers and great opportunities for health, wealth and happiness . Ah yes - of course - this prediction must be referring to Fair Trade & the health, wealth & happiness that it brings to dark strangers. Spot on. And who said astrology is bunkum? Most importantly - a HUGE thank you to all our customers for what turned out to be fantastic record-breaking December. It was the best month EVER - and 37% above the long-term average. With three months to go in this financial year, this puts us in good stead for our 25 year celebrations on 11/6/11 . THANK YOU - and keep up the good work! 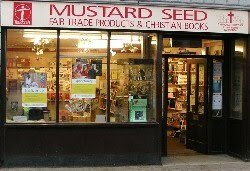 It may also partially explain why most of the national retailers are reporting big drops in sales during December; not just because of the dip in the economy & the coldest Dec ever etc, but also because people are choosing to shop in the Mustard Seed instead. National news hasn't picked up on this yet - but WE know. Our shops will be wholesome & good !